Looking "where to sell my AMC Hornet?" Ask the Chicago Car Club! Are you wondering "where to sell my AMC Hornet ?" The Chicago Car Club is interested in classic cars of all makes and models, especially a AMC Hornet. We make the process of selling your AMC Hornet quick and painless. In just a matter of hours we will have your classic valued and, if you do so choose, turned into money in your pocket. All it takes is a phone call or electronic inquiry to get the ball rolling. 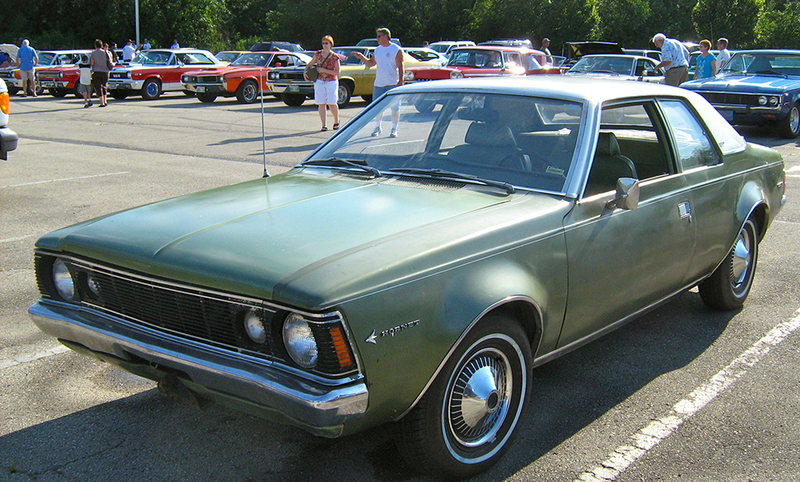 The AMC Hornet was a series of cars offered by the American Motors Corporation between the years of 1970 to 1977. The Hornet replaced the popular Rambler in the US and Canada. Their direct competitors at the time were cars like the Ford Maverick, Plymouth Valiant and Chevy Nova. It held its own among much competition. The Hornet was not a single car, but a whole platform that went through many forms and two distinct eras. During this time the cars were mid-size to large family sized car. They came in 2 or 4-door sedans as well as a large 5-door station wagon. The second generation also came in several forms, including a midsize and large family car, as a 2-door and 4-door sedan, a 3-door coupe, and a 5-door station wagon. The name for the Hornets dates back to the Hudson Hornet, which was introduced back in 1951. The Hudson Hornet stockcar racing team racked up many wins and became quite famous. The “Fabulous Hudson Hornet” passed its name to AMC in a merger. Hornets were not only made for the domestic American and Canadian markets, but they were offered under license, for assembly in other countries. Some of the foreign automakers producing the Hornet were Toyota S.A. Ltd. of South Africa, Vehículos Automotores Mexicanos in Mexico (VAM), and Australian Motor Industries (AMI).